Avry knew, when she healed the girl, that her days of running would be over. She knew that her actions would be reported and she'd be executed for being a healer. But she couldn't lie there and listen to a child drown on the fluid in her own lungs. She just couldn't. So Avry did what she was born to do. After the plague that killed two-thirds of the population of the Fifteen Realms, the survivors placed blame at the feet of the healers who were rumored to be responsible, rumored to have denied their healing to those who had fallen ill. Since then, her kind has been systematically hunted and killed. It didn't matter that the rumors were wrong, that the healers didn't actually start the plague. It didn't matter that the remaining public was misinformed about a healer's ability to cure plague victims. So Avry knew saving the child's life would mean the end of her own. She had no idea that she'd be rescued by a small band of men in desperate need of a healer. She had no clue that her journey with them would take her across the Realms, or that their race against time stirs the eddies of conflict in an approaching war, as remaining leaders start to maneuver for control and power and Realms are realigned. She didn't know her fate would become intertwined with that of a man she'd just met and couldn't trust, or that she would be called to save a man she considered a vicious criminal. She had no idea that her life would never be the same. Then again, Avry thought she'd be dead. She'll find out that death would have been easier. It's been several years since I read Maria V. Snyder's Study series. In fact, The Study Series Bundle was one of the first things I downloaded on my very first Kindle after a friend lent me Poison Study in paperback. Over three years and fifteen hundred books later (no, not all of them read...yet), I couldn't miss out on her new series, despite it being outside my normal preferences. I very rarely read in the Young Adult category, so I can't even say for sure that this is a Young Adult book. I don't know what the parameters are for such a label and wouldn't presume. I can say that if I were a young adult, or a parent of one, I'd consider the material in this book age-appropriate. Avry is twenty, but the subject matter and the content are such that it would work for late teens. I enjoyed the creativity and imagination of the world building. I loved Avry, who is strong and sharp and loyal...but also fallible and flawed. She makes a solid narrator, and I was thoroughly entertained by her wonderful logic. Even though I would have loved a glimpse or two into the head of the bane of her existence, Kerrick of Alga, I found the first person perspective worked well for the storyline. It's an ambitious storyline at that. The journey that Avry takes with Kerrick and crew isn't just a physical one. There's a large amount of personal growth involved as well. I liked the scope and depth of the tale, if it fell a little flat for me in execution. My biggest problem was with the pace and the tone of the narrative. Avry is a fairly dry, sardonic character who has spent three years living as guarded a life as possible. She's not exactly one for a lot of emotional expression. Unfortunately, as she's relating the events of the story, those events seem to unfold in as emotionally monochromatic a way as possible, with little to no inflection. Things traumatic and horrifying are related to the reader with the same emotional impact as Kerrick finding yet another cave or the group deciding who takes first watch. For all that the story is interesting on a mental level, it had almost no emotional impact on me at all. That severely impacted my appreciation for the threads of romance betweeen Avry and Kerrick, which completely failed for me until very late in the book. Everything was so unemotional that I just couldn't sense any connection between them at all - except for general aggravation - until the last few chapters of the book. Compounding that issue was the abrupt transition of the romance. The enemies-to-lovers theme is a favorite of mine, but Avry and Kerrick rode their mutual antagonism so far into the story that the flip, when it came, was too abrupt and too late to feel it balanced out the preceding strife. Also a concern was the somewhat uneven amount of description in the book. Some aspects of the world, the characters, the political situation, and more are glossed over in almost perfunctory fashion, other things are described in such detail that it became overwhelming. The pace of the book overall is fairly slow and steady, but there were times when details became extreme and bogged down the narrative. Still, I enjoyed the story. 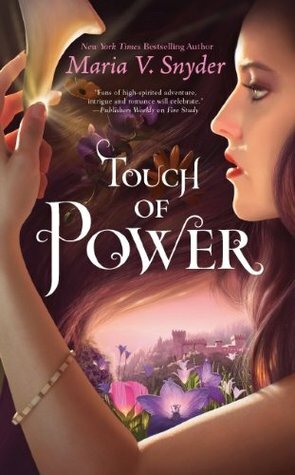 Perhaps not quite as much as I did the Study series, but it's early yet, and I did enjoy Avry enough to want to find out what happens next in this lovely fantasy series. There were just enough plot threads left dangling to keep me wondering, but not so many that I felt this book was incomplete. That, along with the imagination and creativity of the world and likability of the characters, is what will draw me back to this series in the future.